I get asked this question a lot, and it’s a pretty easy answer for me. I always say, spend less than you earn. Ask that exact question to any personal finance expert and I bet that 9 times out of 10, they answer the same way. However, I always want to talk about the second best piece of advice too because I feel that it goes hand and hand with the advice I just mentioned. That advice would be to learn about compound interest. If you learn about compound interest, I can guarantee that it will encourage you to stockpile that money you are saving from living on less than you earn. Essentially, there are two types of interest: simple interest and compound interest. With simple interest, you will only earn interest on your initial principal deposit. For example, if you deposit $1,000 in the bank and it earns 5%, you will earn $50 in the first year. In the second year, you are still only earning interest on the initial deposit of $1,000. So, assuming that the interest rate is still 5%, you will earn another $50. If you kept the same $1,000 deposit in the account for 10 years, you would have a total of $1,500 in the bank (10 years of $50 interest payments + the initial $1,000 deposit). Compound interest is another beast all together. With compound interest, you will not only earn interest on your initial principal deposit but also on any interest that is credited to the account. Using the same example above, if you deposit $1,000 in the bank and it earns 5%, you will earn $50 in interest, in the first year. However in the second year, not only will you earn interest on the principal, you will also begin earning interest on the interest in the account. So, in year 2 the 5% interest will be credited against the full $1,050 you have in the account and your total interest for year 2 would be $52.50. Pretty sweet! If you kept the same $1,000 deposit in the account for 10 years, you would have a total of $1,628.89. That is an increase in $128.89 from the simple interest calculation. You may be saying to yourself, “so what Adam, it’s a measly $128.89 over 10 years”. Well you’re right, it is. However, when you look at compound interest over 20 or 30 years and with more money, it becomes apparent that it’s a miraculous thing. As I mentioned above, the longer you are able to let compound interest work in your favor, the better. Since the definition of compound interest is the ability to “earn interest on interest”, the additional interest adds up immensely over time. Once again, let’s explore the example used previously. Let’s say that you are wise enough to deposit $1,000 in the bank on your 18th birthday and you miraculously earn an average of 5% annually on the account (I know what is pretty high in these times, but humor me). Let’s also say that over the years, you do not add any additional money to the account and just let it sit. We could even say you forgot about it. By the time you reach age 65, the account will have $7,761.59 in it! The next years interest will be $388.08. That’s a hefty increase from the original $50 in interest you received in the first year. And to think, you didn’t even add another penny to the account! Like I said above, the longer you let compound interest work in your favor, the better. I have created this graph to illustrate that phenomenon. As you can see from the graph, as the interest begins to accrue in the later years, the account value increases faster every year (hence the sharper incline in the later years). What I’m essentially trying to say is, if you save early on in your life, you won’t have to save as much later. 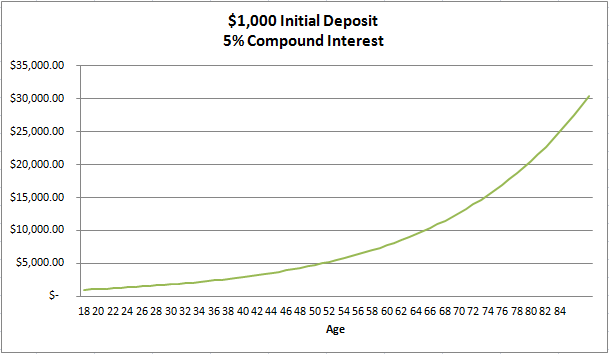 So, you now have a pretty good idea of how compound interest works. So, I would like to show you how essential it is to save early on in your life. In this example, I want to introduce you to Responsible Rachel and Procrastinating Pete. They are two completely different people financially and are both 22. Responsible Rachel understands the concept of compound interest and really wants to take advantage of it. She lives on less than she earns and saves the rest. Procrastinating Pete, on the other hand, really wants to enjoy his new income out of college. He spends everything that he makes (and then some). He doesn’t save a penny. Since Responsible Rachel is so well, responsible, she is able to put $5,000 per year into a Roth IRA (we’ll talk about these is a future post). Let’s also assume that she invests it into a growth mutual fund that averages about an 8% annual return. She does this every year until she reaches 32 when she just decides to stop. In those 10 years, she will contribute a total of $50,000. As you can see, Responsible Rachel already has approximately $78,227.44 in the account before Procrastinating Pete even puts in a dime. However, in the back of your mind you are more than likely thinking that even though Procrastinating Pete got a late start, Responsible Rachel stopped contributing all together, and there is no way that she will have more at age 65 than Procrastinating Pete because he is still socking away $5,000 a year. At age 65, Responsible Rachel will have a whooping $1,070,944.07 in her account while Procrastinating Pete will only have $856,584.02. That’s a difference of $214,360.05! You also have to take into account the fact that Procrastinating Pete contributed $120,000 MORE (of principal) into his account than Responsible Rachel did into hers. So, he has $214,360.05 less in his account while contributing $120,000 more. Crazy! The main thing that I want to hammer home is that the sooner you get started, the more opportunity you have for compound interest to work in your favor. Be more like Responsible Rachel, and not like Procrastinating Pete. It is tough to put money away when you’re young, especially if you have student loan debt, but for every dollar young people can afford to invest the payoff is HUGE. Nice reminder, GO RESPONSIBLE RACHEL! I understand the compound interest thing, but don’t you have to pay taxes on that interest too? I had PPL stock and reinvested the dividends and used it to purchase more stock (no broker fee). Would I have to pay taxes on those too, or wait till I cashed in the stock? If you use a tax-deferred account (IRA, 401(k), etc.) you would not have to pay taxes until you pulled the money out in retirement. That is the most preferred method for compound interest growth. If you are using a dividend reinvestment plan (DRIP) you have to pay taxes on the dividend even if you roll that money right back into the stock. Dividends get a better tax rate though so there is that. Compound interest is still working in your favor. The gain on the stock is deferred until you sell it. As long as you hold it for at least 1 year, you get long-term capital gains rates which would be about a 15% tax on the gain. Cool article. I’m only 20 and I’m already looking at doing this. Go me! Keep going full speed ahead! I did hear about something where it’s tax free? What kind of account is that? I heard most Mortgage and Bank corporations use this. Can someone shed light on this? Where would I have to go to start investing my money? Is there a smart place to invest your money and get a better return at the end? Investing has it’s risks, but taking on some of those risks can reap you a higher reward. If you’re looking for an all-in-one investment platform with instant diversification and low costs, check out Betterment. I’m in the process of moving all of my funds there right now. They can also help you with gaining more knowledge in investing. Hey, such a great article. Unfortunately I am procrastinating Pete as I am approaching my 33rd birthday and have not begun any serious retirement planning. Is there anything I can do to make up for the lost time and still have a more favorable scenario like responsible Rachel? Any info would be much appreciated. The great thing about investing is that you can have as much or more than Rachel! However, since you’re starting a little later, you just need to save more at this point. You can use the retirement tool on a website such as Personal Capital to see how much you need to save to hit a certain target. For investing, I use Betterment. They help you create a well diversified portfolio at low costs. The more people that know about the power of compound interest the better. We’ll have wealthier citizens and far fewer going into debt. I am trying to get my student loans paid off within 3 years (over $60K), however reading above I am wondering if it is more important to pay the minimum in student loans for those years and put more money in my investments. I am 27, but not so behind. I have been investing with my company match for at least 3 years. Also married and trying to get $10K towards a Roth. My question is again should I invest all my money towards the investments to get compounding interest happening quicker and pay the minimum in student loans or do you advise paying off the student loans quickly and then putting towards investments? Hey Tara! If you’re committed to bettering your finances, I typically recommend contributing up to the match and then using all of the extra income to get out of debt as fast as possible. Then, when you’re out of debt and have a fully funded emergency fund, throw as much into your retirement accounts as possible. Check out The 9 Steps to Financial Freedom for more information. The recommendation comes with a condition. You must use all of the extra income for paying off the debt. 🙂 If you’re not committed to that, you’d be better off adding more to the retirement. However, I think focusing on one thing at a time is key. This is one of the best articles about importance of saving out there on the internet. One point I would like to point out is that, not only will Pete not be able to catch up to Rachel till age 65, he might actually not be able to catch up to her at all after many many years (more than human age), even if he keeps adding 5000 to his account and even if Rachel does not add a single penny. And this scenario applies even if one calculates the same numbers for an amount as big as 5 million dollars instead of 5000 dollars per year. Rachel ALWAYS wins because of her head start with saving. Rachel’s money will always be more than 1.16 times Pete’s money. Great blog! I’m still a student and have just turned 27. I received an inheritance and will be putting $38,000 into my retirement account for a total of $50,000 invested until I’m 65 years old. I plan on investing in shares, property, fixed interest, etc. Here’s hoping my retirement is nice! I want to thank you for paining a lovely portrait with this realistic scenario for young and mature adults alike to take notice on investing sooner rather than later. I was thankful for being around the “right” crowd early in my Army career and that crowd painted a similar picture which help sparked the investing flame within. My eldest son is currently recovering from cancer and has spent the last 7 months in the hospital. Dante has a tentative release date of 23 May 18 and will turn 21 on July 16th. As one can imagine, he is eager to a full recovery soonest and blaze his own trail of success as he’s been derailed since his senior year. I emailed him this article in hopes that he will add investing young to his lofty goals. Now he cannot say when he gets my age, “I wish someone told me about investing when I was in my 20’s”. Cheers!